Or this bookcase that's currently shown in a family room, but I could make it work in a kitchen right? Then I would just need a little visit from Eddie and Jaithan to style it and I'd be good to go. I think now that summer is in full swing and flea markets and yard sales are all over the place its time to get serious and look again for that right piece. oh my goodness LOVE the one with the glass doors!!!! can't wait to see what youfind!!! I love this idea and wish I had space for it in my kitchen! I'm sure you'll find something great. Now I'm no Eddie, but I can totally come to Boston and help! 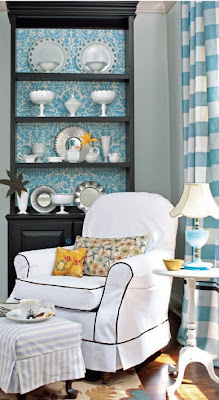 Love the bookcase in the family room..it would make me happy!! How fun would it be if Camila did come for a visit?!! I agree with you, a fresh eye can make all the difference! I really love the first one with the turquoise wallpaper. The display is also beautiful! Good luck with your hunt!!! I love all of these. I'm really thinking about doing this to my china cabinet that has glass doors. It's oh so boring right now. You have so many good ideas! I need that first one for my milkglass! haha! I currently am using a bakers rack, but its also moonlighting as a bar and wine rack. 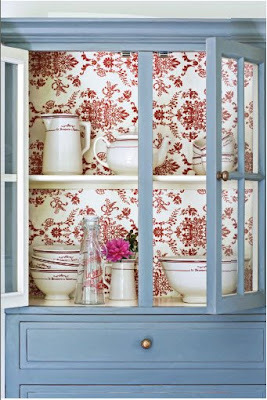 a cabinet like that with some fab wallpaper would be divine.